The government of Iraq is committed to implementing a stable macroeconomic framework driven by significant growth potential in the oil and gas sector as well as non-oil industries, said a recent study. A potential leader in emerging markets, Iraq offers unlimited investment opportunities and requires over $30 billion of foreign direct investment (FDI) per annum, according to Frost & Sullivan’s recent study – ‘Iraq’s Untapped Opportunities; Path to Investment Boom’. After three years under combat operations, the end of Iraq’s war against the Islamic State (ISIS) encourages the country’s reconstruction and economic reformation. As a result of healthy foreign international reserves, limited restrictions on cross-border fund transfers as well as an attractive legal framework that provides greater protection and incentives for foreign investors, investments in the country is expected to generate the highest rate of returns, said the study. In 2018, governments from over 76 countries, global funds, organisations and investors pledged $30 billion in loans and investment to rebuild Iraq, it added. Apart from FDI, primary opportunity areas for global companies also include technology upgrades and manufacturing process improvement across all industries. Most industries operate on obsolete or old technologies as wars and earlier sanctions prevented access to latest technologies. Therefore, Iraqi companies seek to partner with global companies to benefit from their best practices in manufacturing processes. “The plan is to not only privatise existing state-owned enterprises but also support SMEs with tax holidays and financial incentives. All in all, FDI inflow is expected to help the Iraqi Government to achieve the target within the next five years,” he added. Mineral oil, natural gas and phosphate deposits are among the top natural resources in Iraq that call for huge investment opportunities along the value chain. Huge volumes of mineral reserves remain untapped. This provides enormous opportunities for excavation and extraction of minerals. Opportunities are thus significant for mineral extraction companies, equipment suppliers as well as downstream investors. Lucrative prospects are likely present for private investors, especially in the sectors that are currently in dire need of re-building and development such as banking, minerals, renewable energies, telecommunications, landfills, e-Commerce, recycling, water and sanitation, food and tourism. “Of these sectors, oil and refineries is the most promising sector for investors followed by industrial and manufacturing, infrastructure, health and education, energy and agriculture sector,” he added. To attract foreign investors, the Iraqi Government has offered a list of guarantees and privileges including tax holidays for 10 years (extendable to 15 years in some cases), the right of ownership and protection against seizure or nationalisation of the investment project, the right to deal on the Iraq Stock Exchange (ISX), rent or lease lands needed for the project for the term of the investment project, the right to repatriate the capital brought into Iraq and many more. With a population of nearly 40 million, Iraq is also emerging as one of top consumer markets in the Middle East that primarily depends on imports. 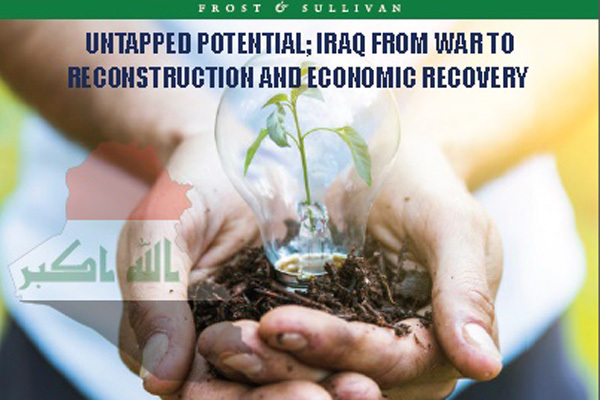 Frost & Sullivan’s recent study, Iraq’s Untapped Opportunities; Path to Investment Boom, highlights the growth potential in the following markets from 2018 to 2022 – Grains, Food & Beverages (8-10 per cent CAGR), Pharmaceuticals (10-12 per cent CAGR), Beauty and Personal Care (8-10 per cent CAGR), Furniture and Homewares (5-6 per cent CAGR), Footwear, Textile and Apparel (5-6 per cent CAGR), Medical Devices (18-20 per cent CAGR), Consumer Electronics (7-8 per cent CAGR) and Plastic Products (9-10 per cent CAGR).